Much of the Earthwork and Paving work undertaken by Hard Rock Construction involves extensive utility relocation, repairs or new construction. The Hard Rock team is highly skilled in the various aspects of utility work. Supervisors focus heavily on safety as well as quality control. Hard Rockemploys three underground utility crews and can perform sewer, drainage and water installation with great expertise. In January 2011, Hard Rock began a much-needed project for the City of New Orleans on Berkley Avenue. 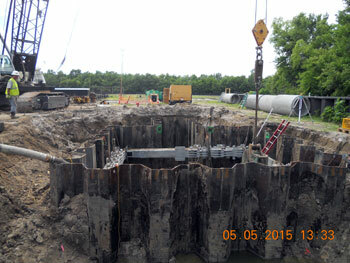 The Berkley Avenue project consists of various new utilities with installation depths ranging between 6 to10 feet. Working at these depths requires extensive knowledge and experience, another reason why Hard Rock is awarded the tough jobs! This Laplace, Louisiana High School was inundated with flood waters from Hurricane Isaac in 2012. But it’s hoped that when school starts in August of 2015, ESJH will be much more fortified thanks to a massive new drainage & levee system commissioned by FEMA. Hard Rock Construction was tasked with installing new & larger drainage pipes, as well as creating a five-foot levee or berm around the school’s perimeter consisting of steel sheet piles & earthen material. In addition, the school is being equipped with its own pumping station to protect from future storm water. New concrete parking lots and access roads were installed as well so that school buses, staff and students can travel safely across the new levee berm. 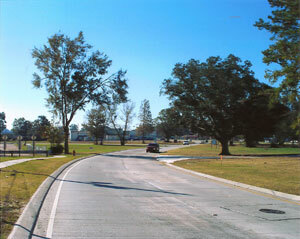 Located in the heart of the city of Denham Springs, the Range Road Corridor was not just another road project. It provides a focal point for the city and a much-needed overhaul of roadway and underground utilities. The construction involved complicated lane closures and traffic flow issues. But Hard Rock was able to balance safety concerns for drivers and workers alike with the need to complete the job on time. This $4.9 million project was completed in 2008.